Well, April is almost over, and so will be the month of my self imposed paleo challenge. Only a few more days! Although I have to admit, I don’t mind this new way of eating. I doubt I’ll stray much from it once the challenge is over! Sausages! Need I say more? Yum! 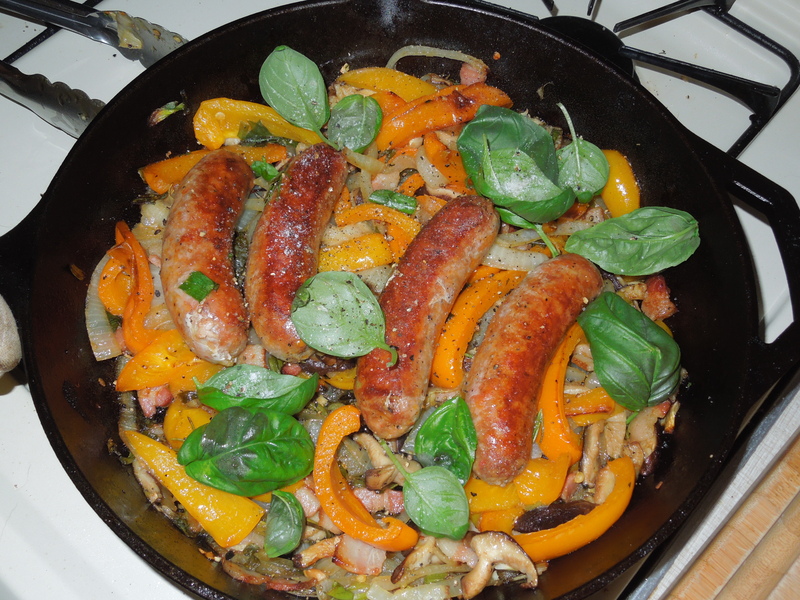 My hubby put together a delicious meal of Italian sausages with peppers, onions, and mushrooms all cooked together in a cast iron skillet and seasoned with basil, salt, and pepper. I didn’t miss the sausage bun at all! I also really enjoyed this breakfast! We’ve gotten in to a routine in the mornings where I first make coffee and then bacon and eggs for us to have together before the hubby heads off to work. 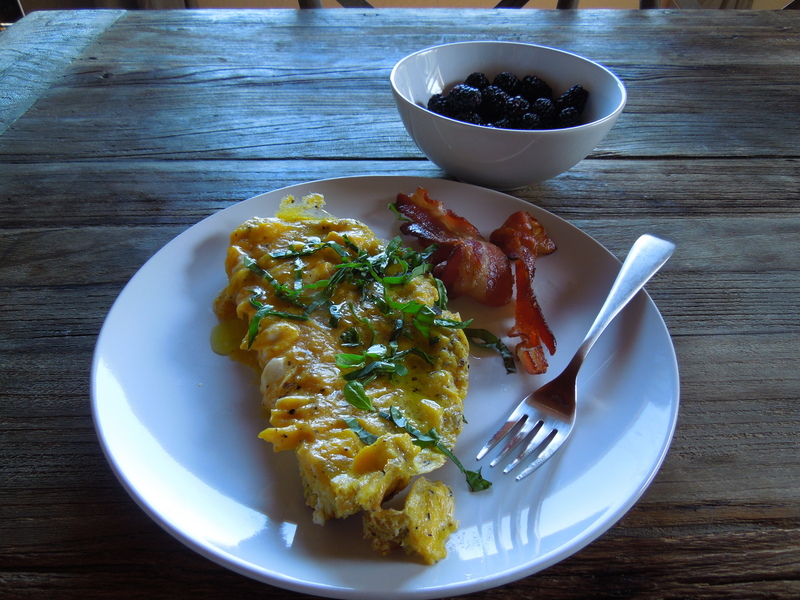 But one morning, he beat me to it and whipped up some baked frittata-like scrambled eggs with basil, a side of bacon, and berries to fill the corners. This was my favorite breakfast all week! 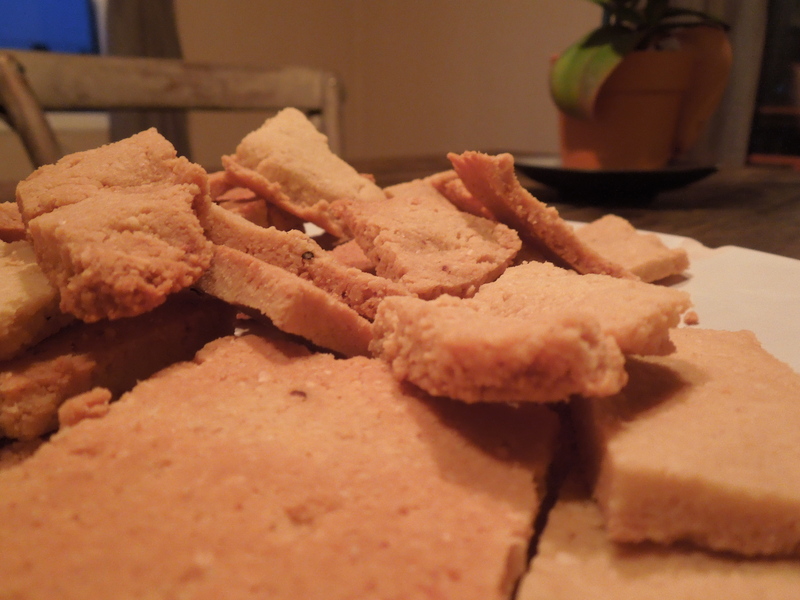 We also made chicken liver pate, and in a search for something to spread it on found this simple recipe for paleo crackers and adapted it a bit. (We used garlic olive oil, and skipped the rosemary to avoid an extra trip to the grocery store.) They were delicious, a little bit addictive, and very munchable even on their own. I learned that fruit is perfect for satisfying a sweets craving. Really what you’re craving most of the time is sugar, and fruit has plenty of that! It’s just the all natural kind. It makes me realize that I can rely more on fruit for sugar and less on things like cookies. So in the future when I do have a cookie or three, it will be a more enjoyable special treat! Honestly, my body has really normalized to this way of eating! I continue to have clearer skin, more predictable and less dramatic hunger over the course of the day, and my energy level remains even. All good things! It definitely motivates me to be more paleo than I was once the challenge is over (even if there are occasions to fall away from it every now and then… like ice cream on a hot day). But more on my plans for the future in my final paleo update next week! Have you been trying this along with me? How do you feel? 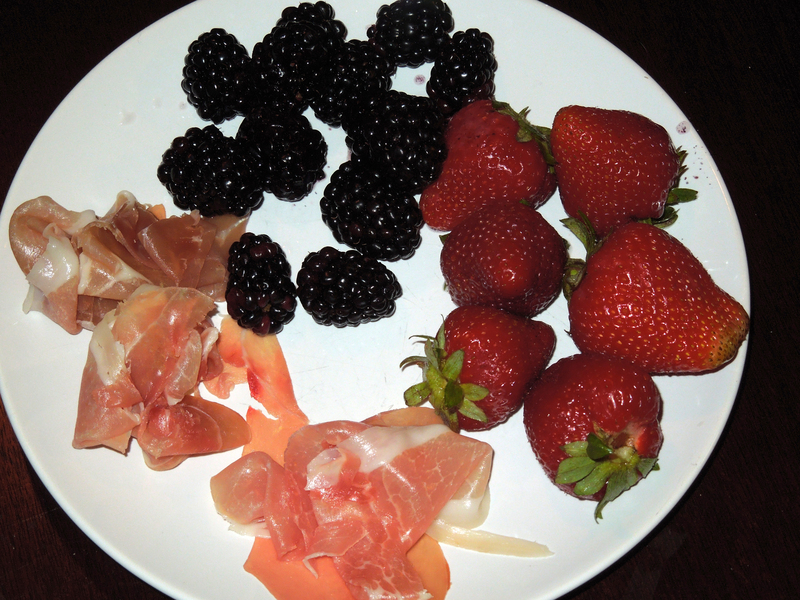 This entry was posted in Food and tagged #anecdotalgoat, #berries, #breakfast, #crackers, #fruit, #paleo, #prosciutto, #sausage, #skillet, #snacks. Bookmark the permalink.